The thing about recruiting is that it’s usually very manual and labor intensive, and the opportunity cost (as well as the actual cost) can be very high. But on the other hand, hiring is perhaps the single most important activity you want to get right. So how do you balance the cost of hiring with the importance of hiring? A friend of mine, Phil Laboon, recommends a hiring tool called Dux-Soup, which is a Google Chrome extension that lets you easily scour LinkedIn for sales prospects or hiring prospects. Dux-Soup can basically help you semi-automate the upfront part of your hiring process (identifying candidates). It’s about $15 per month. 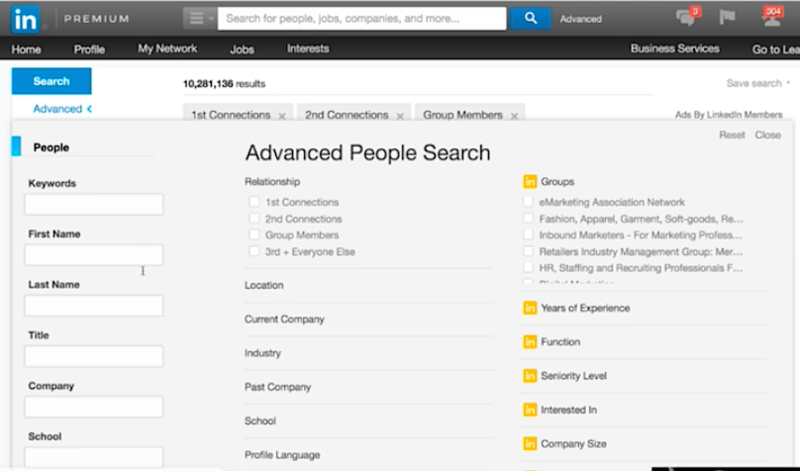 Right now, I have a version of LinkedIn Sales Navigator that’s $49.00 per month. With this paid version you have more filters to search through. For example, if I’m looking for someone who’s in sales and advertising, I can easily set those filters. For years’ of experience, my favorite range is between three and five years or so. Then I’ll directly search for relevant keywords in profiles. Second-degree connections and group members are also great, because they’re a natural warm intro and referral. Ideally, you’re looking for probably a minimum of a couple hundred results and up to about 500 results. In some cases, your criteria may be too narrow, so you might want to use fewer filters. Once you’re getting good results, save those filter settings. Then you can go back to it later for other hires. Sometimes, if the hire is particularly important, you’ll want to do the exact opposite and make your search criteria even more granular. If you think your search results are looking good, just click on the Dux-Soup Chrome extension. First, you’ll have to tweak your settings. Number of days before revisiting: I set it to 7 days so we don’t hit the same people over and over. Visiting speed: I’ll usually set this to about 300 per hour and pause every two minutes or so (so it doesn’t look like too much of a bot). Once your settings are saved, all you have to do is click Visit Profiles. It’s really important that you don’t let your computer go to sleep because once your computer goes to sleep it’s gonna stop visiting profiles. That’s why I have a little add-on called Caffeine for Mac. It makes sure that my Mac doesn’t go to sleep when I go away. Just make sure you turn down your brightness and that the computer is plugged in. One thing I’ve noticed over the years is that a lot of companies, even great ones, are lazy when it comes to recruiting. They have these inscrutable job postings that are like product spec requirements, and they don’t really care about the copy on their postings. That’s a mistake—it drives away some really talented people from applying. Another mistake with recruiting copy is to not leverage your own profile. For example, on my LinkedIn profile right now I have “We’re looking to hire a killer salesperson for our marketing agency” at the top of my summary with a link to the job posting. By doing this, I find that I’m getting more warm referrals and saving a lot of time and money. 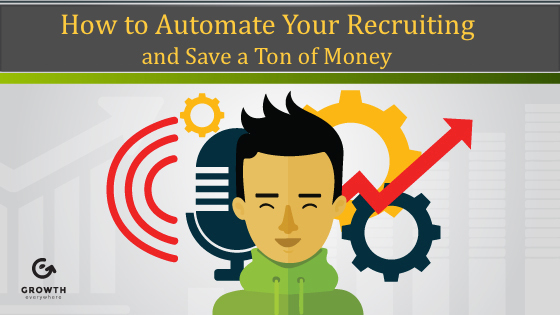 Follow these simple steps, and you’ll have a solid recruiting process without having to pay a couple of thousand dollars or 20% of the first year’s salary, which is typical of headhunter fees. I’m not saying that recruiters aren’t helpful, but to be honest most companies can’t really afford them. And whatever money you have to spare should be focused on sales when you’re growing. After that, once you’re in the high 7-8 figures per year, then you can worry about investing more into recruiting because at that point your focus should be on hiring the best possible talent.